SuretyGroup.com writes surety bonds for waste tire storage sites. Imagine a landfill with 300 million tires. Now add another 300 million tires to that pile next year. Every year the U.S. scraps enough tires for 75 million cars. Those tires don’t decompose when left in landfills or illegal dump sites and can cause major environmental and health issues when not disposed of properly. Tire dumps are a fire hazard, and tire fires can easily contaminate the air and water. Tires are also a popular breeding ground for mosquitoes. The invasive Asian tiger mosquito came to the country in imported tires and has been known to transmit several diseases, including the West Nile Virus, which can cause encephalitis. Something had to be done to protect residents from harmful effects of tire dumps. In 1985, Minnesota passed the first laws regarding scrap tires, and more states followed. But in 1990, only 11% of tires were recycled. Currently, 48 states (all but Delaware and Alaska) have laws regarding tire management, and in 2015, the percentage of recycled tires climbed to 87.9%. Recycled tires are often used for tire-derived fuel, ground rubber applications, civil engineering, and other products. In 1970, Illinois became the first state to adopt an Environmental Protection Act, and the Illinois Environmental Protection Agency (EPA) was created. The Illinois EPA works to regulate and monitor the state’s environmental issues to protect health, welfare, property, and quality of life for residents. Illinois drivers contribute 14 million used tires every year, enough for 3,500,000 cars. All those tires need someplace to go, and landfills are not the answer. The EPA oversees industry statutes and regulations for tire generators, transporters, processors, and end users. The agency wants to make sure that owners/operators won’t abandon tire storage sites, and will perform removal in accordance with their removal plan. 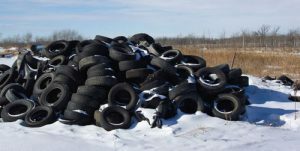 Individuals who have over 50 used or waste tires on their property, or sell tires at retail, must notify the Illinois EPA and register their tire storage sites every year. This includes a $100 annual fee that is due by January 1 each year. Owners/operators of waste tire storage sites in Illinois need to obtain financial security. A part of this registration includes securing financial assurance, which guarantees proper removal or disposal of waste tires. The financial assurance is in an amount equal to or greater than the currently approved removal cost estimate. It can be a trust fund, a letter of credit, or a surety bond. A combination of these is also acceptable. Owners/operators who use a surety bond must also establish a standby trust fund. A surety bond must be obtained from a surety company that is licensed to do business in Illinois. SuretyGroup.com meets that requirement. Contact our Surety Bond Specialists a free quote that fits your specific situation. Email info@suretygroup.com or call 844-432-6637.